Finding the average of all return observations under consideration. Measuring the distance of each return observation from the average return. Squaring the distances from the average return. Dividing the sum by the number of observations. In order to save time, candidates that are using the Texas Instruments BA II Plus calculator can make use of the calculator's "Statistics Worksheet," which can calculate standard deviation with just a few keystrokes. To access the calculator's statistics worksheet, type [2ND] . Note that the "2nd" function of the  key is "DATA." The statistics worksheet remembers any past entries until they are cleared, so you may need to clear previous entries. If this is the case, once you have accessed the statistics worksheet, type [2nd] [CE/C] (note that the 2nd function of the [CE/C] key is "CLR Work"). When the calculator is ready, you should see the following on the display: "X01 0." The calculator can accept two series of data: an "X" series and a "Y" series. I suggest that you use the "X" series. So, X01 is the first item, X02 is the second, and so on. Thus, you will need to skip the prompts for "Y" values. At this point, you are ready to do statistical calculations, including standard deviation. To access these calculations, type [2ND] (note that the "2nd" function of the  key is "STAT." The calculator should respond with "LIN" which indicates that the calculator is in "linear regression mode. This is what you need. The calculator also does other regression modes (exponential, logarithmic, etc.). If something other than "LIN" appears, type [2ND][ENTER] until you see "LIN." At this point you may use the [DOWN ARROW] and the [UP ARROW] to cursor through the statistical calculations. The first item is the number of observations in the worksheet (in the "X" series). The next item is the average observation (in the "X" series). The next item is the sample standard deviation (in the "X" series). 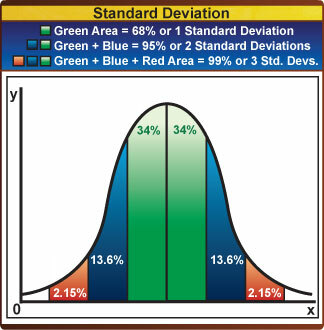 The next item is the population standard deviation, which is the item you need (in the "X" series). If you have entered the keystrokes correctly, you should see that the standard deviation is 4.94. Reading the keystrokes in this post may make it sound somewhat difficult, but if you practice this method, I am sure you will find it much faster than calculating standard deviations "long hand." Having said this, I do recommend you calculate it both ways (using the statistics worksheet and "long hand") for the maximum learning experience.